When you switch to NSX edge and you setup DHCP for you network, you find yourself wondering or looking for some IP address of a new device you hooked up. 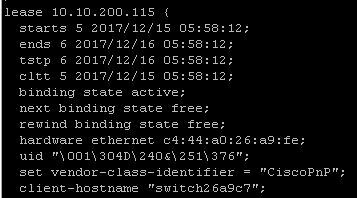 Since there is nog overview in the NSX interface you have to SSH into your NSX edge. It shows you the ip address and much more of all your DHCP lease devices. For example. i hooked up a new Cisco switch and it looked something like this.